So who the hell are dreamgirls? One of the most famous member in the group is Tia Lee ( Li Yu Fen), the Taiwan lookalike Vivian Hsu (she is known as little Vivian Hsu in Taiwan)....who is she? Reminds you of Vivian hsu? 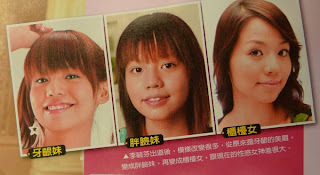 Ok so that is abt a Taiwanese gurl who had plastic surgery n yet she look super natural. Wonder where did she had it done. Now have a look at how good taiwanese are at doing make up. Below is a famous model on yahoo bid tw. Check it out. If you go to to Ximending, 9 out of 10 girls will put on fake eyelashes, if you haven't try any, try one and see how it actually make your eyes way much bigger than it is. Hello Megan, Thanks for this lovely post. The images are really looking so beautiful. the videos are also very informative. Thanks for posting all the helpful information. i will be happy if you write some blog about facial plastic surgery. Malaysia Mega Sales Is On! Amanda Seet Malaysia FB famous "lenglui" another plastic? Amanda Seet enhance her features further - chin implant?